I know that your Bibles are broken-in to turn to Luke right now, but we’re going to take a break from Luke for the next two weeks to bracket Holy Week, Passion Week. Every year on Palm Sunday, I like to take a break from our current series and focus on the meaning of the Cross. And then next Sunday, of course, we focus on the Empty Tomb–the Resurrection of Jesus Christ. Today, I want to focus on the Cross through the experience of a man who appears in all four gospels but nowhere else in the Bible. This man shows up at the end of each gospel, has an incredible experience with the Lord Jesus, and then disappears from the written record. Jesus is on trial. It’s a mockery of a trial. It’s trumped up charges, it’s lying and cheating and false witnesses. It’s a midnight monkey court–completely illegal. It’s a conspiracy of strange bedfellows–all of Jesus’ enemies have momentarily put aside their differences to put away Jesus. And at this point in Jesus’ trial, he is before the Roman governor–Pontius Pilate. Jesus has already been arrested, beaten, humiliated, and gone through a trial by the Jewish religious leaders. Now he appears before Pilate. And what happens here changes the fate of a man named Barabbas. Matthew chapter 27, starting in verse 11. Jesus is fulfilling prophecy here. He is acting just like Isaiah 53 said He would. And that brings Pilate to respect Him. Pilate believes that Jesus is innocent of the charges against Him. We’ll see that more in a moment. So, Pilate comes up with scheme to release Jesus and to seem merciful and powerful at the same time. So, you see Pilate’s idea. He has the custom of releasing one prisoner to the crowd at the Passover Feast. The crowd gets to choose. Pilate knows that the Jewish leaders are jealous of Jesus’ popularity. And he guesses that the crowd will go with the popular Jesus much to the consternation of the Jewish religious leaders. So it’ll be one in eye of the Sanhedrin while appearing powerful and merciful at the same time. But Pilate’s plan doesn’t work. Barabbas was clearly a bad guy. Matthew only tells us that he was a notorious prisoner. But Mark, Luke, and John fill in more details about Barabbas. Barrabas was a robber. He stole things. And he was also an insurrectionist. He was a trouble-maker. We might call him a terrorist. And he was, according to the other gospels, a murderer, a killer. Barrabas was one bad dude. Do you remember last year on Palm Sunday I talked about the two bad guys on either side of Jesus? One on His left and one on His right? They were both notorious prisoners like Barabbas. The same Greek word is used for them, as well. In fact, I think that it is highly likely that the third cross that day was prepared for Barabbas. He was quite probably scheduled for execution by crucifixion on that very same day with those other two bad guys. But on this day, Pilate offers the crowd to release Barabbas. Barabbas may have been popular, as well. He was probably a terroristic threat to the Romans, but he might have been popular among the Jewish people and thought of as a freedom fighter. Maybe, maybe not. Robbers and murderers are not normally popular. Pilate assumed that the guilty Barabbas (and there was no question that he was guilty) would be less popular than the innocent Jesus. Pilate’s wife had been having nightmares all night. And God was probably telling her through her dreams that Jesus was innocent and that judgment was coming. Notice how many times Pilate, in effect, asks the same question. He already asked them in verse 17. He asks again in verse 21. He doesn’t like the answer. He asks again in verse 22. It’s important to note that Pilate couldn’t really wash his hands of this action. If he had wanted to, he could have stood up to the crowd. But he was a coward and caved in to public opinion. And he has forever reaped the consequences of his cowardice. But how much more responsible are the people in verse 25 who wanted Jesus’ blood to be spilled! “Let his blood be on us and on our children!” And it is. Jesus was rejected by His own. His own received Him not. And that led to the most important moment in Barabbas’ life. V.26 again. It’s a terribly beautiful picture of the gospel. The story of Barabbas is a terribly beautiful picture of the gospel. Barabbas, the guilty, goes free. Jesus, the innocent, takes his place. I come to realize that I am like Barabbas. In this story, I’m not always quick to identify with Barabbas. At first I want to identify with Jesus. He’s the good guy. He’s the hero. I want to identify with Him. But as the story goes on, I realize that I’m more like Pilate or more like the crowd. Like Pilate, I want to wash my hands of tough choices. I want to cave in to the crowd. I want to go with the flow. I want to be liked. I want to be admired. I want to be seen as powerful and authoritative and merciful. I want my little schemes to work out for my benefit. Like the crowd, I realize that I am responsible for Jesus’ death. His blood is on my head. If I think about Barabbas at all, I think of the total injustice of it. Why should Barabbas go free? He is a robber, an insurrectionist, a terrorist, a murder. He is notorious. He is GUILTY! Why should he be released? But when I really think about it, I realize that I am like Barrabas. I am guilty and Jesus, the innocent, took my place. What a great and terrible picture of the gospel! Barabbas was set free. Jesus was handed over to be crucified. Now, Barabbas’ freedom was physical before an earthly judge. But it is a picture of a greater freedom, a spiritual freedom before a heavenly judge. Pilate didn’t judge justly, though he sat on the judge’s seat (v.19). But God who does judge justly is also satisfied to look on Jesus in condemnation and pardon me. In big theological words, we call that Penal Substitutionary Atonement. Jesus took the penalty in our place to atone for our sins. Barabbas’ story is a terribly beautiful picture of the gospel. Let’s apply that to our lives in three points. #1. BELIEVE THAT YOU ARE LIKE BARABBAS. We each need to see this for ourselves. We each need to see ourselves as guilty and needing someone to take our place. Now, Barabbas didn’t choose it for himself. The crowd chose it for him. But you and I need to choose to put our trust in Jesus’ sacrifice for us. We have to believe that He took our place. We have to believe that His death paid the penalty for our sin. And we have to trust in Him and Him alone. Believe that you are like Barabbas. Have you come to understand that Jesus took your place? That that cross was meant for you? That you were meant for an eternity of punishment for your sin? And that Jesus took your place? The Bible says that for us to be saved, we need to recognize that we are guilty, to turn from our sins (that’s called repentance) and to put our trust in Jesus and what He did for us (that’s called faith). And then, we become like Barabbas, set free before the judge because someone else took our place. #2. BE THANKFUL THAT YOU ARE RELEASED. Amazing Grace, My Chains Are Gone, I’ve Been Set Free! We can’t lose the wonder of being released by the death of Jesus for us. That Cross is the center of our faith. It is the center of Christianity. It is the center of our relationship with God! And we, of all people, should be truly thankful! You know, there is an interesting thing about this man’s name. Do you know what that means in Hebrew? It’s possible that Barabbas had a famous father. Maybe even a famous Rabbi or another notorious criminal! He didn’t even need another name. Just Son of the Father. But the true Son of the Father–God the Father!–took Barabbas’ place. And if we have trusted in Jesus as our Savior, we become Sons and Daughters of the Father! We become Bar-abbas in a whole other way. And if that doesn’t thrill you, there is something wrong with you! You are a son or daughter of the King! And that should make us the most thankful people on Earth. Because what happened there was evil, but it was for our greatest Good. Thank you, Lord! Thank you, Lord, that we are released like Barabbas. #3. BE A NEW PERSON BECAUSE YOU ARE SET FREE. Can you imagine what Barabbas must have felt? We don’t know if Barabbas ever saw Jesus. Jesus never appears to have been kept with the other prisoners. He was tortured and tried all night long. We don’t know if Barabbas was brought out for the crowd to see to make their choice between him and Jesus. We don’t know if Barabbas ever saw Jesus face to face. We aren’t told what happened to him next. We don’t know if he went back to robbing, killing, and scheming. The Bible doesn’t say. His disappears from the written record. If you, the guilty one, had been set free and the innocent one had taken your place? You’d have a new lease on life. You’d have a chance to start again. You’d be “born again” and free to live a different way. You might have hope and excitement and anticipation. After all, you were supposed to be crucified today. And here you are, a free man. The gospel frees us to live new lives. Not free to go back to our old ways–though that temptation would be there, too. But free to live in new ways. Ways that are like the one that took our place. Because of what Jesus did, be a new person because you are set free. Be a new person because you are set free. I don’t know what kind of temptations you are struggling with right now. I could rattle off a list and it would hit someone, most of us, right now. Anger, lust, fear. You name it. You don’t have to live in those sins. Jesus took your place so that you can be a new person. Not all at once, not perfectly. But really. Truly. You can change. His death was efficacious. It did something. You were set free. Free to come to God. Free to relate to God. To have a relationship with God. To belong to Him and to become like Him. David Mathis at DG wrote this short blog post on Barabbas, and it inspired me to write tomorrow's message. Spring must be here. We have 11 chickens, and we got 11 eggs today! Bob Kauflin on various styles of worship leaders you meet. Funny! Thank you for praying--everything went well this morning. We've had a very good day in Philly. The Country Bumpkin gets to take his wife to the big city today! Heather and I are off to Philadelphia for my Oral Case Study Exam at CCEF/WTS. Tomorrow at 9am, I will sit down with 2 professors for 60 minutes to go over a case study with them. It's pass/fail. Then I will get to meet with the reference librarian and the director of the center for theological writing--starting on my project in earnest. Would appreciate any and all prayers for safety, wisdom, clarity, competence, confidence, and serendipity! The newest issue of EFCA Today has hit the online newstands. This year, I get the privilege of being the Book Review Coordinator. This issue is the first one where I got to "coordinate." The book reviews are on pages 20-21 of the pdf. Especially interesting: Check out the slideshow of our Disaster Relief Team in Haiti. [Matt's Messages] "Q&A with Jesus"
Our passage for today includes one of the most world-famous parables of the Lord Jesus–the parable of the Good Samaritan. The Good Samaritan. I assume that almost everyone here knows the story well. We’ve all heard it taught in Sunday School Classes, Bible story books, and sermons–however, in 12 years of preaching here, this is my first time to ever preach this passage of holy Scripture. The parable of the Good Samaritan appears only in the Gospel of Luke, and while I’ve preached occasional messages from Luke, this is our first time through the whole book together. But everyone knows this story. In fact, I think it will be very difficult for us to hear the story as if it was were the first time. That’s always something I’m trying to get us to do when we approach familiar passages–read it as if it were the first time. But this one is hard to approach that way. It’s just really familiar. But one thing that we often miss when we think about the parable of the Good Samaritan is the immediate context. The conversation going on between an expert in the law and Jesus. The parable appears in the middle of a back and forth, back and forth Q&A session between an expert in the law and the Lord Jesus. And it’s actually that question & answer session that reveals to us what this parable is really about. It’s actually about more than we usually think it is. It’s about what we think it is about, but it’s also about more. And as we read it, I want you to notice who is asking and who is answering the questions. Jesus has this way of turning someone else’s questions into questions for someone else. Let’s stop there and set the stage. We don’t know when this happened. Luke has decided that this story fits well right here. But it happened at some point during Jesus’ ministry. An “expert in the law”–a lawyer–asks Jesus a question. Insert your favorite lawyer joke here! Now, this guy was not a lawyer like we think of today. This was, as the NIV indicates, an expert in the law–that is the Old Testament law. We might think of him as a Bible scholar. A professor of Bible. And he asks Jesus a question. It’s a good question; but is it an honest question? Is this man seeking truth? No. Luke says that he “stood up to test Jesus.” The King James translates that word “test” as “tempt.” He was putting Jesus to the test. Now, that’s interesting question, especially how he asks it. He wants to know about inheriting eternal life. How do you “inherit” something? Well, normally, someone dies, and it is given to you because you are a part of that person’s family. So, this man thinks that he’s in a family that were there is an inheritance to be expected and the inheritance is eternal life. What family would that be? God’s family. Probably he assumes that eternal life is his birthright because he’s a Jew. But...he also asks what he needs to DO to inherit. What are the conditions for inheritance of eternal life? That’s the question. Who asked it? So, Jesus answers his question with a lawyer question of His own. See that in verse 26. Jesus often answers a question with a question. Want to know what to do? Do this and you will live. You DO know your Bible! At others places in the Gospels, this is exactly how Jesus summarized the Old Testament. Love God with what? All of your heart, soul, strength, and mind. That’s just about all of you, right? Love God with your whole being. AND love your neighbor as you love yourself. Now, notice, Jesus has answered the lawyer’s question from verse 25. Q. Q. A. A. Got it? But the lawyer has a problem with his own answer. The answer that Jesus has just affirmed. He’s not sure that he can pull it off. He wants to be justified, that is vindicated. Seen as just and righteous. He wants to inherit eternal life, but the terms, the conditions–that he himself has identified in the Old Testament seem – perilous? Too steep? Too high? He just skips the first commandment, what we call the Great Commandment–to love God. And skips to the second that is like it to love your neighbor as yourself. How hard is this? What is the minimum standard here? Now, the phrase “love your neighbor as yourself” comes from Leviticus chapter 19. And in Leviticus 19, “neighbor” is generally defined for the Jews as fellow Jews. Their brothers according to the flesh. The people that live around you and are like you. You may not always like them they may be rich or poor but they are your people. And they are nearby. So God says that you need to love them. And that’s probably what the expert in the law had in mind for an answer. Is that how Jesus answers? Now, notice how Jesus did the Q&A thing to this man again! Who is answering by the end? The lawyer is, right? Jesus answers the lawyer’s question–what was his question? “Who is my neighbor?” He answers the lawyer’s question–with a story that ends in a question. Now, what is this Q&A all about? What are we supposed to see and feel and think and do because of this exchange between Jesus and this expert in the law? What is this Q&A and its story about a Good Samaritan all about? Hypocrisy is saying one thing and doing another. It’s play-acting. It’s being a hypocrite–someone who wears a mask. Jesus’ story has two hypocrites in it. Who are they? The priest and the Levite. Now, that’s the first surprise of Jesus’ story. The story doesn’t start out with a surprise. Look again at verse 30. This part of the story was not surprising. The Jericho road was treacherous. It dropped from 2600 feet above sea level to 825 feet above sea level. That’s a 1775 foot grade from top to bottom. Very steep. And very rocky. There were all kinds of caves along it, and robbers and thieves and what we would call “terrorists” lived along it and often ambushed travelers. This man was beaten, stripped, and left half head. Now, put in your thinking caps. What do you think was the response of Jesus’ first listeners to the appearance of the priest? “Yea!” right? Here’s the good guy with the white hat to rescue the hurting guy. V.31 “...and when he saw the man, he passed by on the other side.” What? Well, maybe he had somewhere he had to be? That sounds lame. Maybe he was worried about ritual uncleanness? Well, there were exceptions for helping people. And he’s all alone, who’s he afraid of getting unclean? And this man needs help! It doesn’t say why the priest walked by. But he was clearly in the wrong. But, verse 32, here comes someone else. A Levite. Another son of Levi, not a son of Aaron, but a temple helper, to be sure. He’s a good guy. Jesus didn’t say. But he clearly was in the wrong. These guys in Jesus’ story were hypocrites. They talked a good fight, but they didn’t have any fight in them. They had the position of ministry but they weren’t ministers. It is possible to look like a Christian and talk like a Christian and not be a Christian. It is possible, unfortunately too frequently, to be a false Christian. Jesus was warning the expert in the law against hypocrisy. He didn’t really want to know the answer. He wanted to test Jesus. He wasn’t really ready to submit to whatever he found in the Scriptures. He wanted to be known as a Bible Scholar. He didn’t want to love his neighbor. He wanted to know how much he had to do to seem like he really loved his neighbor. He wanted to know just how loving he really had to be. It’s a major problem. Because hypocrites can get away with an awful lot because they please other people. But Jesus is interested in reality not hypocrisy. Jesus is interested in consistency not hypocrisy. Jesus wants us to live out our faith. To walk the walk, not just to talk the talk. I’m glad that you call yourself a Christ-follower. But are you really following Christ? Or is it just an elaborate show? I’m sure that the priest and the Levite looked for all appearances like they loved God. But we know if we love God if we love others. We know we really love God if we love others. And not just the lovable ones. That brings us to the second thing this Q&A with Jesus was all about. The parable of the Good Samaritan is obviously about compassion–and compassion for those we would rather not give our mercy to. When Jesus got to v.33 in His story, I think the audience was shocked! They probably see that priest and Levite were foils for what is to come. They were the unexpected bad guys in story. So the crowd was probably ready for a regular kind of guy to step forward to be the real hero. Maybe not a priest or a Levite, instead a regular kind of Jewish guy. Maybe a poor guy. But a Jewish guy. A neighbor being a neighbor. But Jesus blasts that away. He says (v.33), “But a Samaritan...” What would the crowd have done then? These guys were unclean. They were seen as traitors and heretics and all but enemies of the Jews. Half-breeds and unclean and bad guys all of ‘em. Or fill in the blank with a kind of person that you might have trouble showing compassion to. And that person is seen as showing compassion to one of your kind. And his compassion was active. Look at how active this Samaritan becomes in verses 34 and 35. And costly compassion. Any time there is genuine compassion it costs someone something. I never realized till this week how costly that compassion was. Do you know how many days’ stay the Samaritan paid for the injured man? At the poor man’s rate, these 2 denarii were worth about 24 days in the inn. That’s almost a month’s worth of room and board. Jesus wants us to be caring. Now, that doesn’t mean that we all need to find people who have been robbed and then put them up for month in an inn. It does mean that we need to see the pain and problems of other people and CARE. And do something because of it! To be active and generous and merciful. And not just for “our kind” of people. The example of this Samaritan was of a hated person being loving. How much more should loving people love those who are hated? This rules out racism of every kind. Jesus HATES those who hate based on skin color, ethnic differences, and so on. This kind of compassion is how Jesus loves, too. In the previous chapter, who gave Jesus the most opposition? It was some Samaritans, wasn’t it? The disciples wanted to toast them, remember? Who does Jesus turn around and use as an example? A Good Samaritan. Jesus us want us to be CARING. The expert in the law didn’t really want to let his heart be broken by the things that break the heart of God. He just wanted to know what rules to follow so save his own skin. He was not compassionate. And that’s why he got this story. How are you and I doing at being compassionate? Would someone call you a Good Samaritan? This last week, Pastor Lee Hebel died. Lee was a leader in our ministerium and a friend. He was also actually my 4th cousin once removed. We have a common ancestor named George Mitchell from Mitchell Gap in Perry County, Pennsylvania. Lee was a Good Samaritan. Lee had great compassion for hurting people. It’s because of him that our ministerium provides travel assistance to people who get stuck on Route 80. A night in the motel, a tank of gas, a meal at the truckstop. It’s because of Lee that we provide some fuel assistance for families in the West Branch Area that run out of home heating oil. Lee had a good Samaritan heart for people. He was compassionate. How are you doing at caring about people? Are you just concerned about yourself or are you caring for others? I know that we have a compassionate church. That’s why we can send money to Haiti and elsewhere around the world. But is there more that we need to be doing on an individual level? This Samaritan didn’t have to do what he did. The Priest didn’t do it. The Levite didn’t do it. He could have just done a little. But he was active, generous, and merciful. But there is more to this story, isn’t there? It’s not just about hypocrisy and compassion, is it? What about all of the Q&A? Did this man get an answer to his questions? What was the lawyer’s first question about? Q. How does that make you feel? How are you and I doing at the one? Anyone here love the Lord your God with everything in you? Anyone here love your neighbor like you love yourself? I don’t know about you, but if I were in this lawyer’s shoes, I would have been looking for a loophole, too. I would have asked about loving God, too. With all of my heart, soul, strength, and mind? How about MOST of my heart, soul, strength, and mind? How about a much as I can muster? I don’t know about you, but this standard drives me to desperation. I realize when I hear these commands that I cannot DO something to inherit eternal life. It’s impossible. I won’t be able to DO it! I need someone to do it for me! And that’s exactly what Jesus is. Next week starts Passion Week when the church remembers the suffering and death of Jesus Christ for sinners like you and me. Jesus didn’t die for good people. He died for lost people like you and me. He died for people who couldn’t DO it for themselves. He died to save His people from their sins. By putting our trust in Him and in Him alone. To be saved, we need to be justified by God Himself. And that’s how Jesus saves. He justifies us by His blood. You can’t do it on your own. You can’t be good enough on your own. You can’t be saved by acting the part of the Good Samaritan. You need a Savior to rescue you. If you have not yet trusted Jesus as your Lord and Savior, I invite you to do so now. And if you have trusted Jesus as your Savior, be so grateful that He did what He did FOR YOU. He died so that you may live. It is a privilege to open the Word of God with you this evening. Throughout our West Branch Community Lenten Worship Services this Spring, we have been thinking deeply about the themes of Jesus’ call to discipleship in Matthew chapter 16. Pastor Lee Hebel took Matthew 16:24 and divided it up into phrases for us to chew on, bit by bit, week by week, as Holy Week approaches. These are the words of the Lord Jesus. They are recorded, not just in Matthew chapter 16, but also in Mark chapter 8 and Luke chapter 9. Anything that is repeated that often must be important. I’m going to read it to you in context in Matthew chapter 16. Starting in verse 21 and reading through verse 27. Jesus has just asked the disciples Who the people say He is. And they gave various answers, as there are various answers that the people give today. And then he asked them Who they think He is. Which is the correct answer, but the disciples didn’t really know what that meant. So, starting in verse 21, Jesus begins to explain what it really means for Him to be the Christ, the Messiah. Matthew 16:21-27. I’m reading from the New International Version of the Bible. This was (and is) an incredibly shocking thing to say! You and I don’t feel how shocking this statement was because we’re used to crosses as jewelry and decoration on churches. There are crosses all around this building as there are on our church building up in Lanse. We put crosses up on top of church buildings. But a cross in the first century was not a decoration. It was a gruesome instrument of torture and death. To “take up a cross” was to die. And to die in the most horrific way. If we were to see someone die of cross-ifixion (crucifixion) today, most of us here would throw up it would be so shocking. So, for Jesus to say that to be His disciples, to “come after Him,” we must take up our cross, it was a vivid and shocking thing to say! A daily death. A daily crucifixion. Even more shocking. Well, let’s start with what it does NOT mean. It’s often easier to understand what something does mean when you know clearly what it does not. First, Taking Up Your Cross Does NOT Mean: PUTTING UP WITH MINOR IRRITATIONS. Maybe it’s an irritable person at work. Maybe it’s a chronic condition. Maybe it’s an annoyance in the neighborhood. A bothersome nuisance that we wish would just go away. There is nothing minor about a cross. Second, Taking Up Your Cross Does NOT Mean: WEARING CHRISTIAN JEWELRY OR APPAREL. Now, I don’t think that most of us think it does, but I’ve heard from time to time the idea that “taking up your cross” is giving a silent witness to the cross by wearing a cross. Maybe a cross around your neck or on a Christian T-shirt. Taking up your cross and showing the world that you are His disciple. Now, I’m not against wearing a cross or a Christian T-shirt. I have done both and will probably do so again. But, the most important way to give witness to Jesus is how I live my life and what I say about His gospel to people–not what clothing I wear. Third, Taking Up Your Cross Does NOT Mean: SAVING YOURSELF. Because Jesus died on a cross for our salvation, we might somehow get the idea in our heads that our taking up our crosses is somehow involved in our saving ourselves. Taking up our cross would be suffering in such a way as to somehow complete what Jesus’s cross did for us. But that is not the message of the New Testament. “Our crosses,” whatever they are, are not salvific. They do not save. That’s in the book of Titus. Chapter 3, verses 5-7. Taking Up Our Cross Does NOT Mean Saving Ourselves. If anyone is saved, it is by Jesus’ Cross and Jesus’ Cross alone. So, what does it mean for us to obey Jesus’ call to take up our cross? Let me suggest 3 things. #1. DAILY DEATH TO SELF. Taking up your cross means dying each day to your self. Which was the focus of last week’s Lenten sermon. To take up your cross is to die to yourself, to your agenda, to your plans, your schedule, your possessions, your little idols, your selfishness, your pride. It means to longer be the center of your own universe. No longer to be the most important person in your own life. To take up your cross means to die to your self. That’s part of what we mean when we use the Bible word: REPENTANCE. A turning away from ourselves, our sin, our own agendas. And a turning towards the Lord. That’s not easy. It feels like death! Because it is a kind of death. Death to self. #2. Taking Up Your Cross Means DAILY CHOOSING TO TRUST GOD THROUGH TRIALS. It is not just bearing minor irritations, but it is persevering through difficulty in faith. Every day, we are called to lay our lives down and go through hard things while trusting the Lord. Maybe it’s trusting God through cancer. My favorite mother-in-law was just diagnosed with stage 4 cancer. My wife just got back from visiting her. She lives in Western Canada, 2100 miles away. We’re having to get used to the idea of losing her. My mother-in-law is choosing faith in God each day that she wakes up with that cancer in her belly. Now, lots of people get cancer. But not everyone that has cancer has taken up their cross. Taking your cross means choosing to trust God in the middle of your cancer day by day by day. Daily Choosing to Trust God Through Trials. That’s going to feel like death. Because it is a kind of death. It’s the death of comfort and ease and easy-living. Taking up your cross means Daily Choosing to Trust God Through Trials. Maybe you aren’t going through major trials right now. Maybe taking up your cross is just getting up and doing it all over again tomorrow. Being faithful in the little mundane things. Not just putting up with them but persevering through them in faith. #3. [And last.] Taking Up Your Cross Means DAILY PREPARING TO DIE FOR CHRIST. Remember who Jesus said this to–His disciples. He just said that He was going to die. And He meant that He was going to die! And He’s telling His disciples that they need to be ready to die, too. Remember how shocking this was. Only criminals, runaway slaves, and rebels against the government carried crosses. Only those who were destined to die carried a crossbeam. No one carried a cross by accident! The Cross was the way that Jesus was going to go. And His followers could expect no less. According to tradition, the Apostle Peter was hung upside down on a cross. And that’s how he died. Now, will we all be crucified for our faith in Jesus? No. Not like this. Not just if He leads us into nice, friendly territory. And Jesus is calling us to choose sides in the battle. Daily Preparing to Die for Christ. Because it is. It is a kind of dying. Dying to the preservation of your life at any cost. Jesus is issuing a warning here to those who would claim to be His disciples. Don’t think it’s going to be easy and fun and only full of health and wealth and prosperity. No. Following Jesus means a bit of death every day. That sounds like a paradox, but it’s pretty simple. If you live for yourself and don’t die to yourself, ultimately, you will die and lose yourself. But if you live for Christ and die to yourself, you will live forever and gain everything that is most important forever. You’ll gain Christ. If you have not taken up your Cross, you will get no reward. If you have taken up your Cross, daily dying to self, daily choosing faith in the midst of trials, daily preparing to die for Jesus, then you will get the reward. Jesus died on the Cross for the sins of the world, providing salvation for all who repent and put their faith and trust in Him and Him alone. And if He would die for you like that! Won’t you die for Him? The first is a personal testimony of someone who has moved, over time, to a biblical counseling orientation. His name is Aaron Sironi, and he counsels now with CCEF in their affiliate office out west. This piece gives a good picture of what biblical counseling is--at its best. And second, one of the best proponents of biblical counseling, David Powlison, explains a "centrist" understanding of psychopharmacology and biblical counseling. True wisdom and very helpful. [Matt's Messages] "Sent By Jesus"
It’s time for another short term missions trip. At the beginning of chapter 9, Jesus sent how many disciples out on a short term missions trip? Flip back one page and you’ll see. How many? Twelve. The Twelve. The twelve disciples went on a very short missions trip. Well, at the beginning of chapter 10, Jesus sends another group out on a short term team. This one is 6 times bigger than the last one. Now there are going to be how many missionaries? 72. And they’re being sent out in 36 pairs on another missions trip. They are going to go before Jesus, kind of like John the Baptist did, and proclaim the coming Kingdom of God. Now, there are parts of their mission that are like our mission today. Parts of how they are supposed to do their ministry like how we are supposed to do ours today. There are also parts of how they were supposed to do it then that we aren’t supposed to do now. Specific instructions that Jesus gave them that aren’t applicable now to us. We’ll see that as we read it. Jesus had a mission for them. A dangerous mission. A high-stakes important mission. Only two points this morning. And they’re both one word each. Jesus sends the 72 on a mission. Chapter 10, verse 1. These are very similar words to Matthew chapter 9 where Jesus instructs the disciples to pray for workers for the harvests. Pray for missionaries. Pray for people who will be missional. Pray for workers to go and harvest souls for the Kingdom. Yikes! How would you like that mission? This is a dangerous mission. Defenseless. Risky. Needy. They are to travel light. Dependently. Relying on God. And not stop for chit-chat along the way. He’s not saying to be rude to people on the road. He’s saying that the mission is urgent. They can’t allow themselves to be distracted. They’ve got to GO! Now, these instructions are not the necessarily how we’re supposed to do mission-work today. We’re not forbidden to go in groups bigger than 2, we’re not forbidden to have purses or wallets or sandals or a change of clothes. And we’re allowed to talk to people on the way. But our mission is still dangerous. And it’s still so important that we can’t get distracted. And we still have to pray for more workers. And we still have to GO! Go. Do you see yourself as a missionary for the Lord? Now, some people are vocational missionaries that serve cross-culturally. Our church supports at least 12 missionary families like that. But, in very real sense, we are all called to go and be missionaries wherever God has called us. I think about next week’s Wild Game Dinner. This is a chance for us ALL to be missionaries. To invite an unsaved friend, relative, or neighbor to come hear the gospel. Men, who are you bringing to the Wild Game Dinner? “When you enter a house, first say, 'Peace to this house.' [Give it your blessing. Shalom.] If a man of peace is there, your peace will rest on him; if not, it will return to you. Stay in that house, eating and drinking whatever they give you, for the worker deserves his wages. Do not move around from house to house. ‘When you enter a town and are welcomed, eat what is set before you. Heal the sick who are there and tell them, 'The kingdom of God is near you. '” Stop there for a second. There are two possibilities when these missionaries hit town. The first is that they and their message will be received. They say, “Peace,” and the peace stays. They are fed because they are working. They eat whatever is put in front of them. Back when we are at Moody, we were taught to say to Jesus, “Where you lead me, I will follow. What you feed me, I will swallow.” That’s missions! Why was that the message? Who was coming next? Who were they going before? “The Kingdom of God is near you.” Receive Him! These are strong words. But they are the cost of rejecting Jesus and His message. When the missionaries for Jesus hit a town that rejected them, they were to wipe off that town’s dirt from their feet. And Jesus speaks directly to those northern cities–Korazin, Bethsaida, Capernaum. Their judgment will be awful. If places that were judged in the Old Testament–Tyre, Sidon, Sodom–had had the miracles of Jesus performed in them, they would have repented. But Korazin, Bethsaid, and Capernaum did have those miracles. They had the King Himself among them, and they rejected Him. The Stakes Are Very High! Here is why our mission is so important. If people listen to us when we proclaim the Kingdom and its King, then they are listening to the King Himself. But if they reject us and our message, they reject the King and the King’s Father, as well. Those are very high stakes. Did you notice the message in verse 11 was the same as the message in verse 9? Whether or not we who are sent by Jesus are received or rejected, we have the same message! Now, in verse 9, they said, “The Kingdom of God is near you.” It is for those who receive the message. But in verse 11 it is, only, “The Kingdom of God is near.” It’s near, and they are missing it if they reject the King. But the Kingdom comes no matter what. And that’s our message. The Stakes are Life and Death forever. Eternal life and eternal damnation! Judgment. Being lifted to the skies or going down to the depths. The stakes don’t get any higher. That’s why we have to GO! Everyone around us is going either to up or down. And we’ve got the life changing message. They were pumped. They had a great missions experience. They found success! Yes! Even the demons submitted in Jesus’ name. Why is that significant? Well, if you remember, last week, they’d had some trouble with getting demons to submit. I think Jesus means that, as they were ministering, Jesus saw Satan’s downfall. I think that’s what it means. And He promises them protection and power over Satan and his army, while in Jesus’ service...for now. And then, surprisingly, Jesus turns an unexpected corner. He wants to talk about their joy. V.17 says that they are full of joy. And Jesus wants them to be full of joy, but He tells them to be careful how they rejoice. By the way, that’s #2 of two. You are very very blessed! We have every reason to be thankful. Every reason. That’s the point of Jesus’ prayer in verses 21 and 22. Not everyone does. And some of the people whom you think should know Jesus, don’t! The wise and learned of this world? If anyone should know God, it should be Reverend So and So. No. No one knows who the Father is except the Son and those to whom the Son chooses to reveal Him. And who is that? To little children. To humble. To the simple. To the trusting. To those with faith. Do you know Jesus? That’s something to rejoice about! We are very very blesed. Jesus says so. Look at verse 23. The whole Old Testament–prophets and kings–predicted Jesus. This last week, I have come to understand how very blessed I am. I’ve been blessed with a lot of health. I’ve been blessed with a great wife–who is very hard to live without! I’ve been blessed with some great kids that I love very much. I’ve been blessed with some great friends who have been there for me in the last two weeks. Friends came out of the woodwork to show love to me. ...pale in comparison to this blessing. My name is written in heaven. He has chosen to reveal Himself to me. The Son has chosen to reveal Himself to me. I see what kings and prophets longed to see. I am privileged beyond understanding. And I rejoice in Him! A round-up of good posts on humbly shepherding God's flock. I finished reading The Pilgrim's Progress last night. This poem above was one of the best parts of the book. Bunyan was a master at bringing out the drama of the Christian life and plastering it on the page in the most memorable way. Personally speaking, The Pilgrim's Progress was hard for me to read. I don't think I ever truly "got" the genre and often didn't understand what I was reading. But I'm still glad I read it. Not only can I now say that I have actually read the book, I have been enriched by the vivid portraits of the "people" you meet when you're walking down the street of the neighborhood of the dangerous Christian journey. My biggest take away was that sin is invidious, ubiquitous and our biggest enemy. We need to live vigilantly. My friend, Bob Robinson, urges college students to root their identity in the image of God. D.A. Carson on how Systematic Theology is like a jigsaw puzzle. Very very helpful. 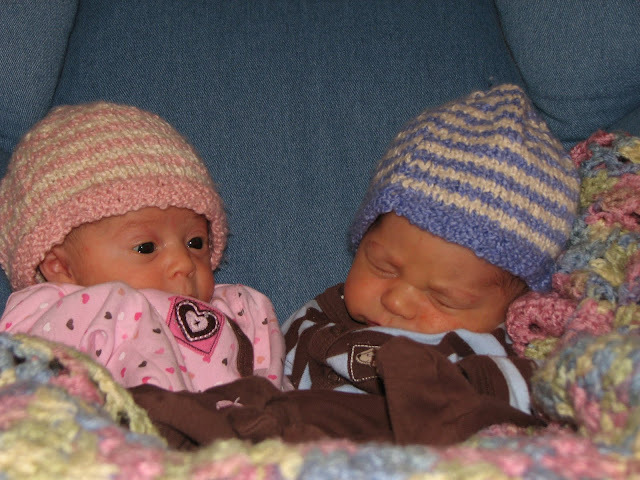 More pictures of my adorable niece and nephew. Strangely enough, when I woke up this morning, I was staring at myself at the top of my RSS Reader! The indefatigable Chris Brauns interviewed me for his blog, and it was posted this morning. He's running a regular feature of faithful, ordinary pastors. I'm sure I'm ordinary, and hope to be faithful.